The Coach dashboard is designed to give you all of the information you need to monitor and coach your teams to higher performance. You can view key metrics, observe performance trends for individuals or the team as a whole, see side by side ratings of your direct reports, and even submit ratings for your own goals. The left panel charts are all inclusive and dynamic so you can view the information that's most important to you. The default view shows the average performance of your whole team across all goals for the past month. Click Change filter in the top right to adjust the time period and the team member to see information for that one particular employee. You can even see your own metrics by selecting Me. After changing the filter, all of the metrics will adjust. Shows a trend line to compare the average rating of the manager and the employee/team. Use this chart to track performance trends over time. Easily see who is working hard to make progress and also notice who is starting to slip. In the event of a downward trend, you can work with the employee to find out the cause of the change and coach them towards improvement rather than just letting them continue with the downward spiral. Know exactly when to reward your high performers and coach those who need help. There are two displays of rating alignment, personal alignment and benchmark. Personal alignment shows the percent of time both you and your employees rated goals the same. The benchmark alignment shows the percent of time the other teams in your company have provided the same rating. These charts are useful in knowing wether or not you and your employees are on the same page about their performance. Compare your personal alignment to the benchmark to know where your team stands amongst the others in your company. From here you can either work more closely with your employees to improve alignment or pat yourself on the back for maintaining full transparency with your direct reports. In this situation, the rating alignment between this employee and myself is 50% for the month of April since we had the same average rating on two out of four rating periods. If this doesn't make sense, just send an email to support@tinypulse.com and we'd be happy to clear it up for you. The two bottom most bars are on the dashboard show you the percent of ratings complete and coaching tips added to goals based on the filters. 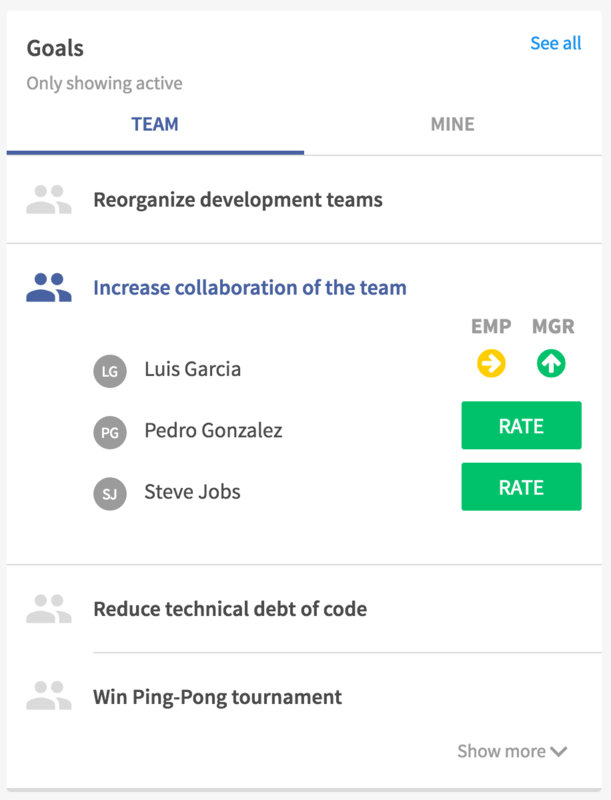 Track how well you've been coaching your teams by submitting your ratings and adding coaching feedback to their goals. This metric is entirely personal so you only see the amount of time you've submitted rating and coaching. The panels on the right side of the dashboard give you quick information about the performance standing of each member, a quick view of the goals, and the opportunity to run a detailed Snapshot report. 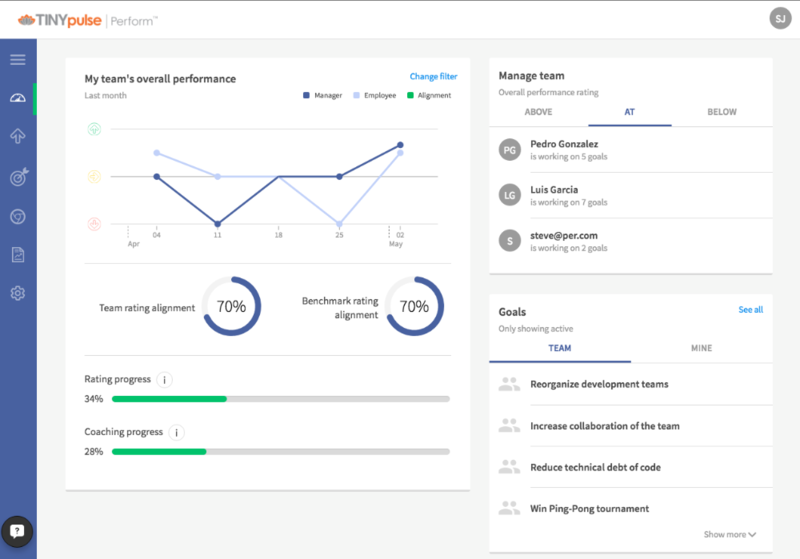 The Manage Team section in the top right panel arranges your team members Above, At and Below expectations based on their average performance. At a glance you can see who's leading the way, on track, and who may be falling behind. Click on the employee's name to expand and see the goals they're working on along with a side by side rating from the current rating period. Finally, in the bottom right are the active goals. Two tabs show team goals and your own goals. 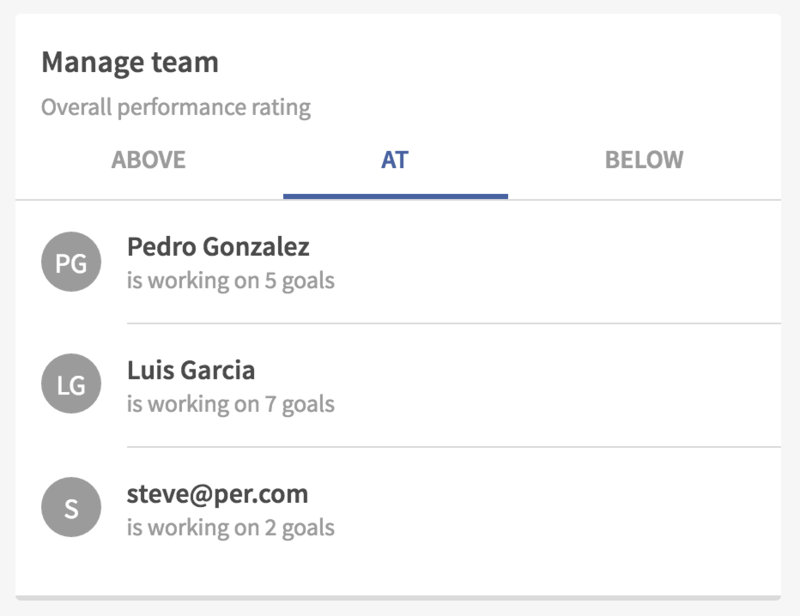 Team goals are those that you've assigned to your direct reports and by clicking on the goal title, you can see who is working towards the goal, view a side by side comparison of ratings from the current period, and submit your rating and coaching tips by clicking Rate if you haven't already done it. Check out this article to learn more about how you can benefit from detailed Snapshot reports for you, your team, or individual employees.